Game Warden Camden Akins grew up in Winslow, Maine. Akins was introduced to the outdoors at a very young age by his grandparents. It didn't take long before he became attached to hunting and fishing. Akins also spent a great deal of time riding ATVs and snowmobiles with his grandfather and step dad. Warden Akins graduated from Winslow High School in 2011. He then attended Unity College where he graduated with honors and received a B.S. in Conservation Law Enforcement in 2015. During his time at college, Warden Akins developed a passion for duck hunting as well as trapping. During his freshman year of college, Warden Akins joined the Unity Volunteer Fire Department where he attended the basic fire school as well as several other courses such as advanced SCBA, Self-Rescue and R.I.T. training. Warden Akins began his career in law enforcement working as a reserve police officer for Old Orchard Beach Police Department in the summer of 2013. From 2014-2016 he worked as a Deputy Game Warden in Naples, Greenville and York County in the summers. During the summer of 2015 Akins completed the Whitewater Guide training. In the summer of 2016 Akins was offered a full time position with the Warden Service and attended the 31st Basic Law Enforcement Training Program at the Maine Criminal Justice Academy. 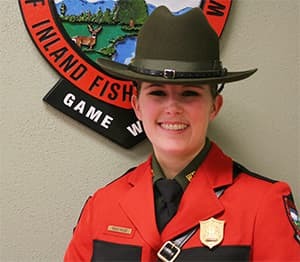 Game Warden Kayle Hamilton grew up in the small town of Buxton, Maine. Hamilton developed a passion for the outdoors from an early age by learning how to hunt and fish from his father and grandfather. Hamilton graduated from Bonny Eagle High School in 2008 and attended the University of Southern Maine where he graduated in 2013 with a bachelor's degree in Business Administration and Finance. After college he was able to earn his registered Maine guide license for both hunting and fishing. In his free time, Game Warden Kayle Hamilton enjoys salmon fishing in the spring, striped bass fishing during the summer, duck and deer hunting during the fall and ice fishing in the winter time. Hamilton was hired by the Warden Service in 2016 and attended the 31st Basic Law Enforcement Training Program at the Maine Criminal Justice Academy. Warden Hamilton looks forward to a career responsible for conserving the resources of the State of Maine that have given him much enjoyment throughout his own life. Game Warden Kyle Franklin grew up in Durham, Maine where his family introduced him to the outdoors at a young age. He grew up hunting, fishing, snowmobiling, as well as participated in other outdoor activities. As his desire grew for the outdoors, so did his desire to become a Maine Game Warden. Franklin took every opportunity he had to either sharpen his skills or learn something new. Warden Franklin attended Brunswick High School and graduated in 2011. In high school, he set a goal for becoming a game warden. He started working towards that goal by attending Husson University. In the summer of 2014, he worked as a reserve police officer in Old Orchard Beach. In May 2015, he earned a bachelor's degree in criminal justice from Husson. In the summer of 2015, Warden Franklin was hired as a Deputy Game Warden and assigned the Sebago Lake patrol for the summer. In the summer of 2016, he was again hired as a Deputy Game Warden where he worked out of Greenville as a whitewater deputy. 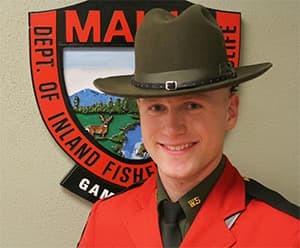 Game Warden Kyle Franklin was able to earn his Maine Guides licenses in hunting, fishing, and whitewater rafting as he worked towards becoming a full-time warden. In August of 2016, his goal of becoming a Maine Game Warden was achieved when he was hired on full-time. Warden Franklin looks forward to his future as a Maine Game Warden and is excited to work for the people of Maine as well as conserve the natural resources that Maine has to offer. Game Warden Megan Miller grew up in the small town of Pittsfield, Maine. She was raised on a horse farm and spent most of her youth outdoors around the farm. She knew from a young age that she wanted a career that allowed her to work in the outdoors. 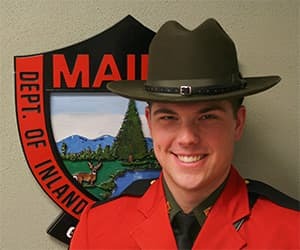 Warden Miller graduated from Maine Central Institute in Pittsfield, and Somerset Career and Technical Center, Outdoor Recourses program in Skowhegan, Maine. Warden Miller was a white water guide in The Forks for Adventure Bound the summer before she attended Unity College. She graduated from Unity College in May of 2016 with her Bachelors of Science in conservation law enforcement. Warden Miller had the opportunity to work for Wells Police Department as a summer reserve officer during the 2015 and 2016 summer seasons. In the fall of 2016 Miller attended the 31st Basic Law Enforcement Training Program (BLETP) at the Maine Criminal Justice Academy in Vassalboro, Maine, and graduated in December of 2016. Warden Miller went on to graduate the 2017 Advanced Warden Academy at the Maine Criminal Justice Academy in Vassalboro, Maine. Warden Miller is looking forward to getting out into the woods and waterways of Maine to protect the resources and serve the people of Maine. Game Warden Taylor Valente grew up in New Gloucester, Maine. Valente was introduced to the outdoors at a young age by his family. His passion and interest in what the outdoors had to offer grew quickly as he spent time hunting, fishing, and exploring the Maine woods with his father and grandfather. Valente attended Gray-New Gloucester High School and went on to study Wildlife Ecology at the University of Maine Orono, earning his degree in 2014. 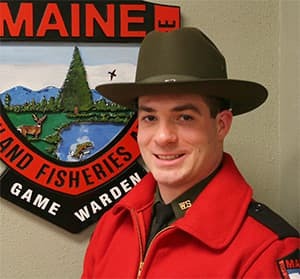 During his time spent at University of Maine Orono, Game Warden Valente's education opened his eyes to how valuable and rich our state is in resources; his desire to protect them and his interest in becoming a Game Warden only amplified. Warden Valente identified the team oriented approach that the Warden Service values as an incredibly appealing factor in this field of work; Valente's value in teamwork developed during his many years dedicated to athletic teams in his school aged years and in college. Valente had the opportunity to work for two years as a Deputy Game Warden, spending two summers patrolling the Sebago Lake area. Valente graduated from the 31st Basic Law Enforcement Training Program at the Maine Criminal Justice Academy in December of 2016. 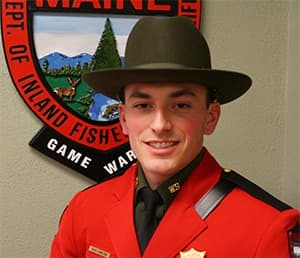 Warden Valente looks forward to his career with the Maine Warden Service and is eager to continue expanding his knowledge and passion for the outdoors with this team.